After the pan-Asian success of KBS’s hit predecessor sageuk drama Love in the Moonlight comes another series transporting us 1500 years back to pre-modern Korea. 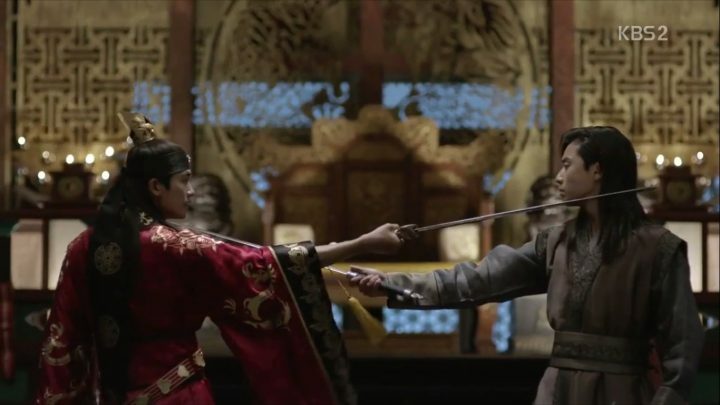 Hwarang: The Poet Warrior Youth is yet again a fictitious recreation of an important epoch in the Korean history — the Kingdom of Silla. 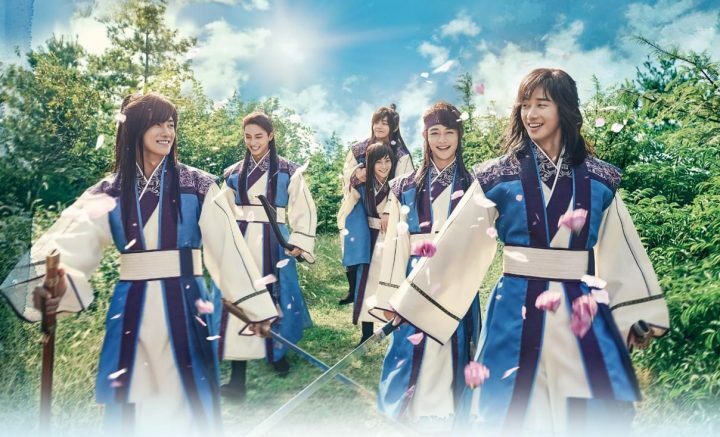 This drama spotlights the Hwarangs (Flowering Knights), an elite group of male youth in Silla known for their great outward beauties and aristocratic family backgrounds. These flower boys pledge loyalty to the state, and are physically, morally, and spiritually-trained to defend Silla and its royal family. The drama really takes off during the middle, helping rescue it from utter depravation. 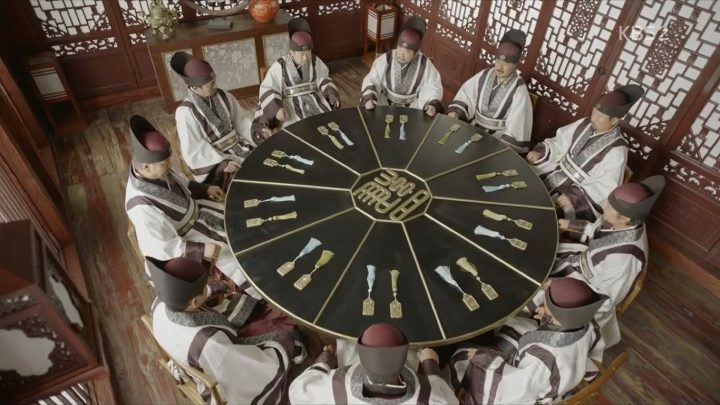 The production team of Hwarang did a fantastic job in forming the ensemble cast in my opinion. As a matter of fact, the drama’s reputable veteran thesps, ravishing actresses, and of course, pretty-faced idol actors (Choi Min Ho, V) forging the roles of Hwarangs contributed a lot in boosting its publicity and viewer anticipation. But despite all the ballyhoos, the series suffers a feeble start, loose ends, and a number of executional flaws. However, the meaty part of the drama really takes off during the middle, helping rescue it from utter depravation. Hwarang kicks off to an anemic start, with brief introductions of its overwhelming set of characters and a little historical vignette introducing the drama’s major predicaments. 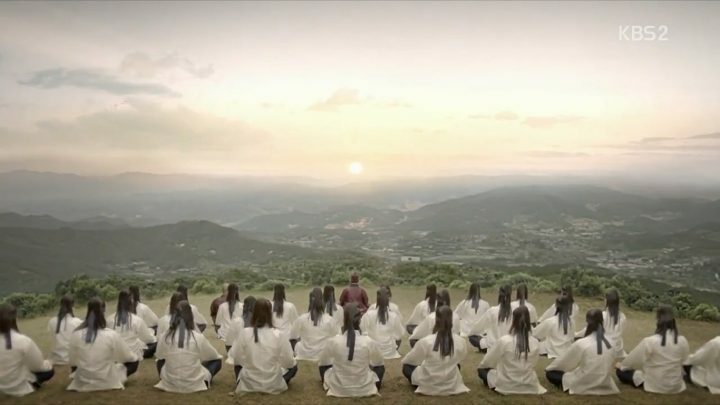 Nonetheless, it successfully flaunts an emphatic overview about its charming subjects – the handsome flowering knights of Silla – and the drama’s main heroine to boot. The onset of the drama is a disappointing ho hum. To begin with, Moo Myung (Park Seo Joon) is an adroit, mysterious young man with the nickname Dog-Bird. He lives with his best friend Mak Moon (Lee Kwang Soo) in Makmang Village along with other peasants who are prohibited to set foot in the Silla capital. Later in the story, Mak Moon’s tragic death urges Moo Myung to assume his best friend’s true identity as the half-breed Kim Sun Woo. 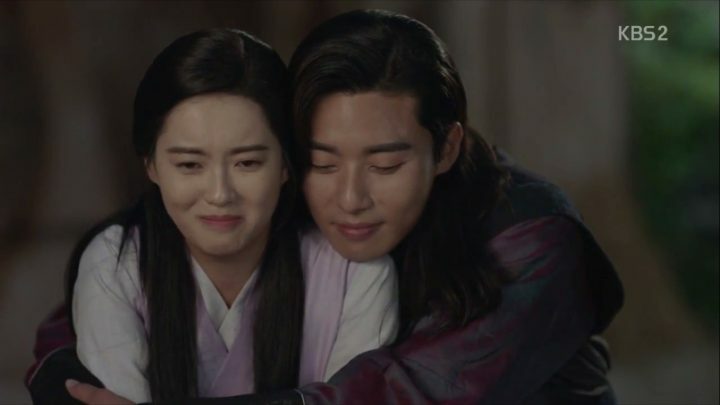 Amidst planning to seek revenge for Mak Moon’s wrongful death, he also feels obliged to protect Mak Moon’s family on his behalf, most especially Mak Moon’s younger sister named Kim Ah Ro (Go Ara). Ah Ro is a half-breed maiden in the Silla capital who is born of an aristocrat father and a peasant mother. Despite all the adversities her family has faced in the past, she remains buoyant and is supportive with her doctor father’s compassionate advocacy. She grows up being self-reliant, however, we can see the notable change in her personality upon meeting Moo Myung. Though initially dubious, she is gradually convinced that Moo Myung is indeed her brother whom she is separated from 12 years ago and begins to rely on him through tough times. Meanwhile, Sammaekjong (Park Hyung Sik) adds up to be a distinguishing character in the drama with his intriguing personal background. Unbeknownst to everyone, Sammaekjeong is King Jinheung, the faceless king in transit. 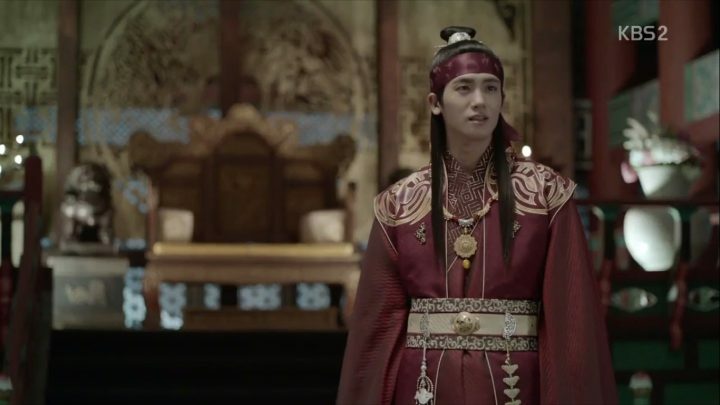 His Queen mother Ji So (Kim Ji Soo) decides to put him into hiding due to assassination attempts by the royal enemies trying to usurp the throne after the King died. The Queen then acted as a Regent in his name while he lived among the commoners in the capital, with his identity masked from everyone. Hwarang has all the hallmarks of a typical historical drama production – lavish period costumes, over-the-top aesthetics, and extravagant backdrop. 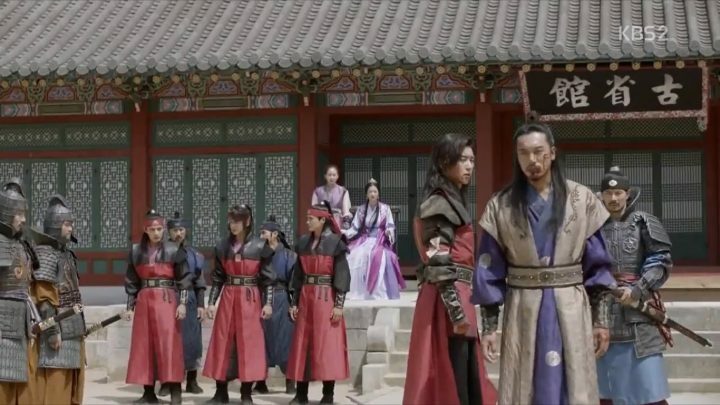 I can also see the drama’s attempt to panoramically deliver the story, specifically with the discussions about the Bone rank system and Silla kingdom’s political and ideological conflicts. However, the onset of the drama is a disappointing ho hum, with the sluggish first few episodes only imparting a dearth of the actual narrative. Even with the presence of occasional comic reliefs, there are plenty of vapid scenes to bear through a quarter of the way in. Enduring the insipid first few episodes is indeed a struggle. Fortunately, Hwarang subsequently anchors the plot with stable progressions making the affairs more galvanizing. True to its title, the next episodes highly focus on the lives of and challenges faced by Hwarangs from their reluctant cohabitation inside the Hwarang residence. 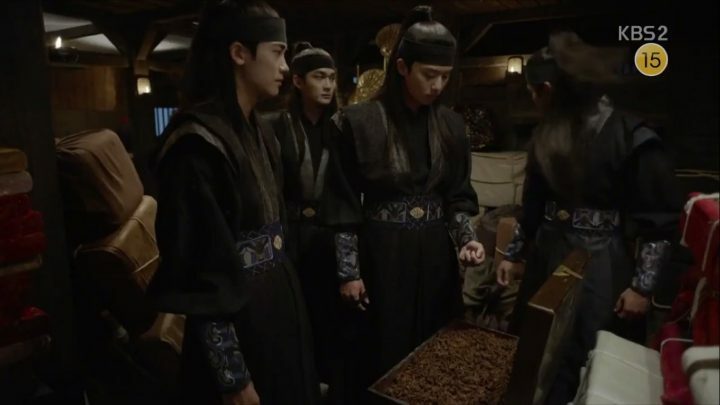 We’re also informed about each Hwarang’s personal quagmires, resulting to their disinclined choice to join the squad. Their boisterous carryings-on filled the drama with a blast of lighthearted entertainment. Plus, their developing camaraderie beneath layers of growing pains become something to look forward to. I heartily enjoy the shifting balance between comic and serious tonalities. 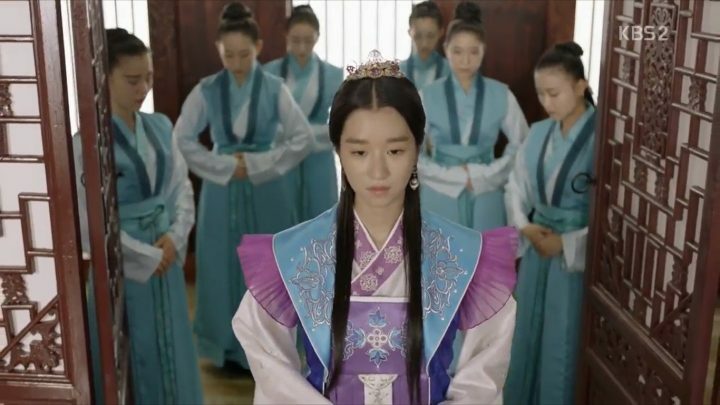 The addition of more characters like Princess Sukmyeong (Seo Ye Ji) and Hwarang’s disciples add more intensity and comedy punch to the ardent footing of the story. I heartily enjoy the shifting balance between comic and serious tonalities, which make the drama more diverting to watch. Meanwhile, we witness some romantic improvements materializing between our main couple in these succeeding episodes as well. 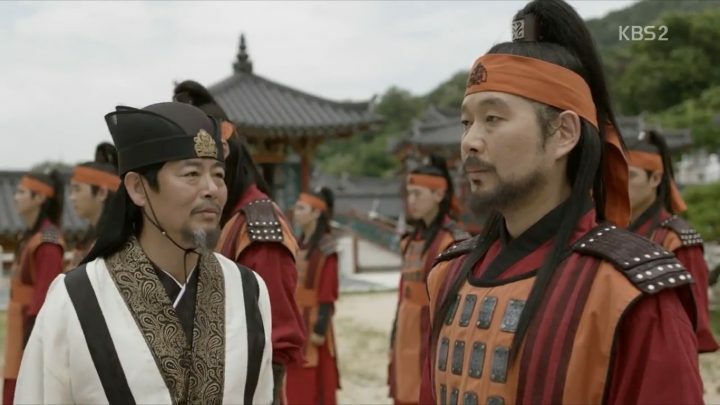 After striving to establish a solid kinship, Sun Woo ultimately admits his true connection with Ah Ro. It’s a wreaking havoc on Ah Ro’s emotions as expected. However, the news does rive that fraternal wall fettering their feelings for each other. We finally see the two of them throwing off their inhibitions to start working on a proper relationship. The only thing that made me slightly aloof while tuning into the drama is Go Ara’s acting. Not to contest her competence as an actress, but there are times when her acting feels either cringe worthy or lacking. There are several heart wrenching scenes where she unfortunately fails to exhibit strong and appropriate emotional delivery, making it harder to empathize with her character. From stodgy beginnings, Hwarang surmounts its prior shortcomings and is able to take a big leap to gripping climax. The great advantage of pre-production smoothly manifests in the ensuing interplays to amplify all the drama’s significant junctures. Hwarang surmounts its prior shortcomings and takes a big leap to gripping climax. 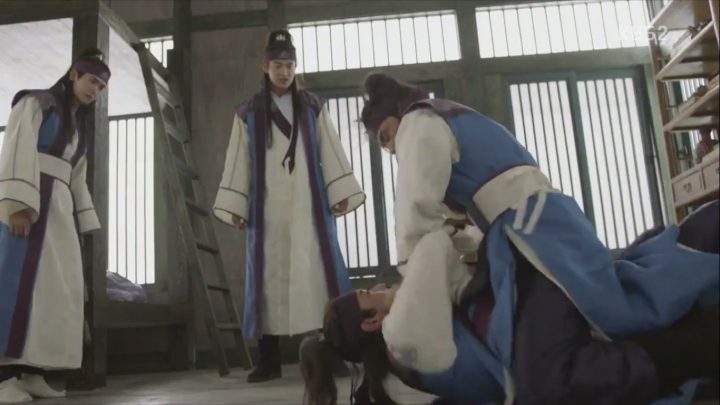 I find myself extremely engrossed in Hwarangs’ character development as the plot deepens. The more they understand the gravity of the purpose for which they are formed, the more they acquire a sense of responsibility in their sworn duty. Moreover, I really do appreciate how the transpiration of tragic events accrues their heartfelt loyalty for one another. We can also notice the rip-roaring rise in conflicts, operatic bloodsheds, filial discord, elevating political machinations and, of course, the tension between our main love trio, with the dumbfounding birth secret disclosures on top. Even so, I am grateful for some light-hearted subplots, like the romance build-up between the competitive and ambitious Park Ban Ryu (Do Ji Han) and Ah Ro’s friend, Kim Soo Yun (Lee Da In). These scenes alleviate the angst strongly emanating as episodes go by. Lastly, the accentuations of each character is pleasantly surprising. Not only our main leads have awestrucking pasts to uncover, but our supporting players too have some bombshell character depths to divulge. To say that the Hwarang’s denouement is satisfying would be an understatement. The mop-up is exquisite and riveting. Severities come to a halt after sequences of jittering quest for a resolution. Justice is uniquely served and the mystery remains until the end, which I particularly love. The intense pace is also maintained even when the drama is already nearing its conclusion. I’d also like to express my commendation that the romance is given just as much needed screen time. 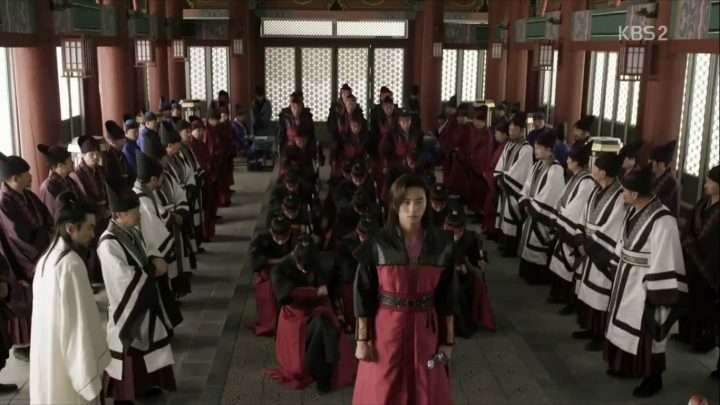 It shouldn’t be the entire focus of the drama as the drama’s grander goal is bringing the lives of Hwarangs and the historical context to people’s attention. So, I praise the writers for living up to the drama’s main theme. It’s regrettable that it suffered the same fate with the also pre-produced drama, Moon Lovers: Scarlet Heart Ryeo despite its decent storyline. One factor is, perhaps, its paltry exposition. It would be more appealing if the drama is able to commence substantially and fully tie up all the loose ends. I also spot some plot holes all along and continues to ponder about some unanswered enigmas such as the morbid reason behind Sun Woo’s occasional fainting. Still and all, my experience in watching Hwarang is satisfactory, though not enough of a reason to rewatch it. It’s a worthy historical lesson and opportunity to rivet in a sea of pretty boys if nothing else — once you endure through the initial slow ramp, that is.